Nothing smells as good as homemade pizza baking with a little bit of competition in the air to make your classroom pulse. This lesson not only allows students to learn how to make pizza dough and sauce from scratch but also helps them develop their plating skills. Teach your students the muffin method with this lesson! Labs make five different kinds of muffins and analyze the finished product for characteristics of high quality muffins. Reverse engineering packaged foods has been a hobby of mine for a few years now. It is fascinating how “they” come up with these products and to see if I can recreate them to make them taste better in my own kitchen. As many of you know and hopefully have tried by now, Subway came introduced their raspberry cheesecake cookies through a free raspberry cheesecake cookie promotion on Valentine’s Day just a month ago. As soon as I tried it I thought it was excellent and immediately wanted to make them in large quantities at home! The purpose of this lesson is to see how different types of flour changes a cookie recipe. The ultimate objective is to determine the best flour to use in this cookie recipe and why flours change the cookie. Help your students get a jump start in the restaurant industry by having them become ServSafe certified! To do this you can either have a ServSafe instructor come and teach your class or you can become a certified instructor. I stumbled upon cake pops a few years ago and decided to give them a try with my hospitality students. We were making food to sell as a fundraiser at the prom fashion show. These are delicious and genius creations sure to be a crowd pleaser. Measuring flour and other ingredients can make all the difference in a baked good’s success. Baking is a science and the slightest amount over or under what the recipe calls for can mean an inferior product or inconsistent results. Teach your students with confidence after learning the difference between these two methods. Since there are already a lot of lessons on yeast and yeast breads, this is a compilation of my favorite yeast recipes, lessons, videos and scientific explanations. 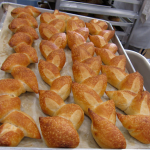 The most common problem in public school culinary classes is finding unique ways to proof & bake yeast doughs given a series of different challenges such as: 50 minute classes, alternating block scheduling, not having the right equipment like a proofing cabinet or steam injection oven, etc.